We’ve all lived through the unintended consequences of even the most thoughtful policies. Adhering to a strict class and bell schedule makes sense, unless you teach at the end of the day and regularly lose many of your students to early dismissal and much of your teaching time to afternoon announcements. And “freshman clusters” sounds like a great idea, unless your district lacks the infrastructure and personnel to support them. But what if we gave stakeholders, namely educators, a chance to research a policy they found irksome (or worse), hone their practices around this policy, and end up fixing what’s broken in the process? Effective teacher leadership recognizes that teachers are essential to the success of a school and the district as a whole. Such leadership can take place in individual classrooms or among teachers, but leadership on a larger scale happens when teachers have opportunities to influence policy. The public as well as policymakers know that teachers are the ones who connect with students every day and have direct knowledge of what is working or not working in the classroom or school. Teacher leaders who are members of the American Federation of Teachers are doing just that. Since 2011, the AFT Teacher Leaders Program (TLP) has helped prepare educators (typically teachers) to facilitate discussions of policy issues that impact the profession both locally and nationally.§ The program has brought together and coached cohorts of teachers to take active leadership roles in their individual schools, school districts, and local communities. As teacher leaders, these educators have served as catalysts to build the profession and strengthen not just the union but also its connection to the community, in order to generate support for and better understanding of public schools. To participate in the program, local presidents submit an application in late winter and are selected in early spring. Once a local is accepted into the program, educators who are interested in joining must submit an application to their local. The local president then selects a member of the local to become a program facilitator, and both the president and the facilitator must attend a two-day orientation run by the AFT. Each facilitator is trained to lead a cohort of approximately 12 educators, called “teacher leaders,” who meet over eight months during the school year, one Saturday each month for a full day. There, they discuss issues in their district and state; receive training around framing policy positions; and then conduct research in their classrooms and schools, participate in conversations with policy leaders, and share their findings and recommendations. These teachers then become leaders in their school, union, or district, and sometimes have a broader impact in the form of lasting policy changes. Once the local has selected its cohort of teacher leaders, the AFT provides resources to support them, including technical assistance and curriculum materials focusing on education policy. The primary curriculum guide for the program is The Power of Teacher Networks by Ellen Meyers, a book focused on how groups of teachers can come together to support each other and also find solutions to the problems they face. Additionally, the AFT offers stipends for participating teachers and facilitators, ongoing support (e.g., meeting planning, monthly conference calls, advice on personalizing the program to best fit a local’s needs, and locating helpful research), and access to a nationwide online community of teacher leaders from all locals currently engaged in this work. 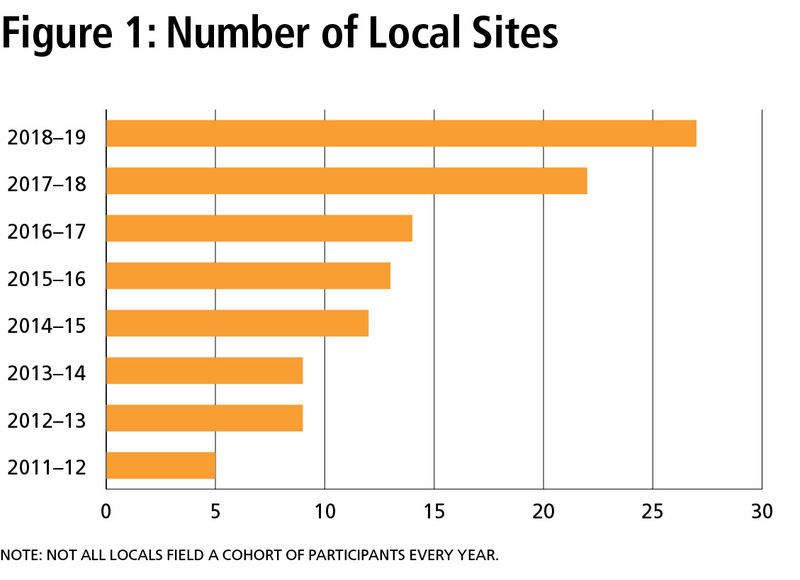 More than 1,000 educators and a total of 32 locals have participated since the program’s inception (see Figures 1 and 2). The impetus for the program was the lack of teacher voice in discussions of national education policy. Why weren’t the people in the classroom asked for their input on ensuring that our children have the best opportunities to learn? To provide an avenue for educators to contribute to policy discussions affecting the profession both locally and nationally, the AFT established the Teacher Leaders Program. A prominent feature of the program is that participants conduct action research on a topic of their choosing based on a local, state, or federal policy they want to study and change. Based on this research, participants have made significant improvements to their schools. At the end of the program year, every TLP participant in each cohort presents his or her research findings at a local showcase to invited guests, which often include local legislators, school board members, school district leaders, and members of the media, as well as friends, colleagues, and family. These guests are often asked to provide feedback on the content and delivery of the presentations. For some teachers, the presentation marks the culmination of their research on the topic, but not the end of their leadership. Indeed, this is an expectation of participants in the program. Others have used their work and their new advocacy skills to help implement their policy recommendations—sometimes with the support of a district or local leader who attended the showcase. Through this advocacy, these teachers demonstrate how teacher voice is essential in supporting what works for schools and students. This advocacy is one important way that the TLP supports these teachers in their leadership growth. All teachers can lead by sharing information with their colleagues and by learning from one another. Other leadership roles are more formal, and they can include peer-to-peer leaders, school-level leaders, and system leaders. We have found that participants in the TLP have chosen to study a wide range of education policies, but due to the structure and requirements of the program, most have selected policies at either the school or system level. All of the participants have been able to use their TLP experiences to advocate for change based on the evidence gathered through their research. Much of the teacher leaders’ work involves working with other teachers. In Nashua, TLP efforts have dealt specifically with teachers leading their peers to make positive changes in their schools. These teachers work collaboratively with colleagues to better support their students. Nashua Teachers’ Union member James Graham became a peer leader to create and implement a coteaching system in his high school. He was dismayed by student performance in his school’s Algebra I courses and believed that roster flexibility and coteaching would benefit both low and high achievers. Graham was able to test his theory by coteaching a class for one unit and comparing the scores from those students with the scores from students in the traditionally taught classes. Students in the cotaught classes showed favorable results, so Graham took his research and recommendations to his principal, which led to a larger conversation in the school around coteaching. The following year, the school had four concurrent sections of Algebra I, in which Graham and his colleagues offered further differentiation through a coteaching model. Preliminary data suggest this model contributed to a slightly better than average increase in the passing rates for Algebra I. Many TLP teachers focus their research on topics that will have a broad impact on their schools. The teachers from Nashua who developed co- and team-teaching plans for their schools have had an impact beyond supporting their peers, as frequently happens. Other teachers have focused on policies that would impact buildingwide issues. For example, Nashua social studies teacher Gary Hoffman focused his research on the number of early dismissals and interruptions during classes at the end of the day compared with morning classes or those in the middle of the day. From the strength of his research, Hoffman was able to set up a meeting with the district’s superintendent, the district’s assistant superintendent, and his building’s principal on the feasibility of a rotating schedule or other alternative solutions. Although the meeting was too late for immediate changes in the current school year, administrators were able to identify the problem of disruptions and significantly cut the number of announcements at the end of the day that interrupted class time. 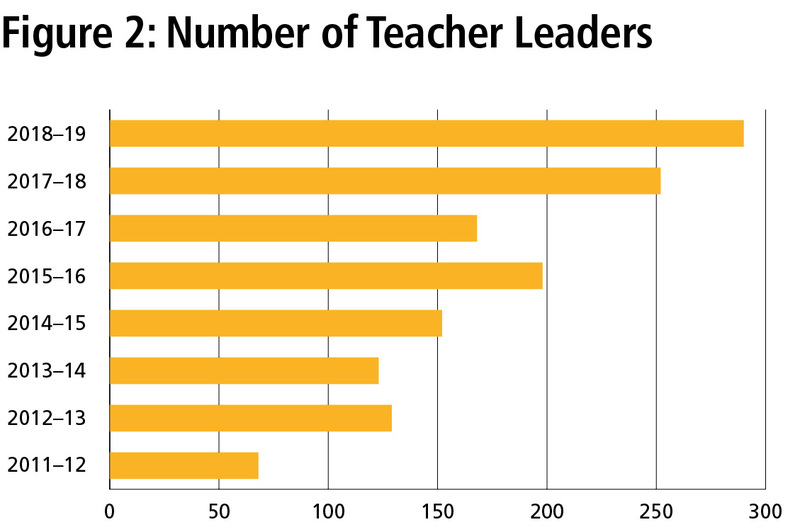 Other examples of these school-level leaders include teachers from Toledo, Ohio. Fourth-grade special education teacher Valerie Powell, from the Toledo Federation of Teachers (TFT), advocated for more computer technology for students in her school. She studied the “free appropriate public education” guarantee under Section 504 of the Individuals with Disabilities Education Act, which prohibits discrimination on the basis of disability, and wanted to ensure the same opportunities were afforded to special education students as their general education peers. Due to her research and advocacy, Powell’s school purchased a cart with 30 laptops and headphones, as well as an interactive whiteboard for her classroom, so that she could enhance the educational support she was providing to her special education students. This computer cart is now available not only to her class but also to the school at large, a change that arose from the application of her research, evidence, and leadership, as well as her advocacy to improve the teaching and learning conditions in her school. In Texas, Dana Wrann, a K–8 special education teacher and member of the San Antonio Alliance of Teachers and Support Personnel, wanted to find out whether mindfulness activities could affect students’ academic success and engagement. After implementing mindfulness practices at the beginning and end of each of her classes, Wrann found a statistically significant difference, based on pre- and post-surveys, in how her students felt about school, their relationships, and conflict management. With her research and findings, she went to her principal to discuss training other teachers on mindfulness practices in her school. This year, the school launched a soft rollout in which other teachers have begun to implement mindfulness with their students. Wrann has also taken this work outside of her school, conducting community trainings on mindfulness. She has written a grant based on her action research in hopes of pushing this program even further. Some participants look beyond their own schools to problems they see in their districts and states, or even on the national level. In researching issues with the district’s “freshman cluster” courses, Toledo high school teacher Amy Netter discovered problems with scheduling many different students into four core classes, especially the science classes. At the conclusion of her research, she made several recommendations to the joint curriculum committee, including adding a full-time data coordinator and another science class, and scheduling a common lunch for these students. Before Netter’s presentation, the committee was unaware of the issues. TFT Vice President Mona Al-Hayani, who is also a high school teacher, recognized the serious problem of human trafficking in Toledo. She was asked to work on a project for the AFT human rights and community relations department, and she used the research, advocacy, and presentation skills she developed through the Teacher Leaders Program to create professional development that she delivered to every employee in her district—from central office staff to bus drivers. Al-Hayani has worked with the AFT and TFT, the Lucas County Human Trafficking Coalition, and Toledo Public Schools to expand her professional development reach; her training is now a required part of the mandatory reporting training for all teachers in the district, and she recently addressed a group of 200 new teachers as part of this work. In Florida, Palm Beach County Classroom Teachers Association members Hazel McFarlane and Karen McFarlane (no relation) examined Exceptional Student Education (ESE) in their district, a program that provides support to students with learning, emotional, intellectual, and developmental disabilities, as well as to gifted students. Feeling empowered from their presentations of their research findings, both teachers became cochairs of the union’s ESE committee. Hazel studied how to ensure ESE teachers are equipped to improve student performance, and Karen researched the IEP (individualized education program) administrative workload of ESE teachers and how that impacts teacher retention and student achievement. Their research will help to ensure that the needs of teachers are prominent in the work of the district’s ESE department, which serves as a network and resource for parents, staff, and community members to help support the district’s exceptional students. Already in their first year of cochairing the committee, Karen and Hazel have seen a vast increase in overall member participation in the committee as well as participation by the school board. In Baltimore, Aaron Cuthrell participated in the TLP for two years, focusing his research on early childhood education. After completing the program, Cuthrell approached his principal, who helped him to start summer enrichment camps at his school for young children. The program has expanded to multiple schools across Baltimore County and Howard County and now supports hundreds of students each summer. After considering a switch to administration, Cuthrell decided to remain in the classroom, realizing the ability he had to support students while staying in teaching. These are just a few examples of teachers creating policy through research and lessons learned from their own practice. Through the AFT Teacher Leaders Program, educators have new opportunities to engage beyond their own classrooms. They become problem solvers and give credence to the work they do every day. The program also has helped administrators, district leaders, and communities to recognize the work teachers do and the dedication they have to improving their students’ lives at every level. The critical professional role that teachers play is recognized and valued in other countries, where educators are allowed regular time during the day to network with other teachers, share best practices, and collaborate to practice and perfect their lessons. ** The AFT wants to ensure that teachers in the United States have the same opportunities to collaborate and the same professional voice and respect as their counterparts in other countries. Teachers can lead at all levels—peer, school, and system. They must be encouraged and provided with the tools and opportunities to influence policy, and that’s why the Teacher Leaders Program was developed. The AFT and its members are fighting to ensure that students across the country have every chance for success. And that means listening to and learning from the people who know the most about those students—their teachers. 1. PDK Poll, “Teaching: Respect but Dwindling Appeal,” Phi Delta Kappan 100, no. 1 (September 2018). 2. F. M. Hess, The Cage-Busting Teacher (Cambridge, MA: Harvard Education Press, 2015). The following are recommendations TLP participants have made based on their research. Schools should implement a Learning Support Leadership Team, comprised of a school social worker, an administrator, school counselors, a behavior specialist, a school psychologist, school nurses, and special education teachers, to collaboratively address school climate issues and reduce barriers to student learning. Incorporating restorative justice practices can significantly and positively impact the culture and climate of an individual school and an entire school district. Restorative circles should be incorporated into any instructional program regardless of subject area or grade level. Create a school garden to encourage healthier eating habits and enhance cross-curricular education. Testing requirements for measuring the progress of English language learners should be reasonable. ELLs should be exempted from graduation-rate calculations and from taking standardized tests used for accountability purposes until their English is proficient. Schools and school districts should not be punished for allowing ELLs, especially those with interrupted or limited formal education, more time to complete high school. Enlist a team of stakeholders, educators, and school administrators to implement the use of green cleaning products to improve student attendance and enhance student achievement for students suffering from asthma or allergies. Annual training on early childhood trauma should be provided for all school staff. Policymakers and the general public must be educated on adverse childhood experiences and their effects. Evaluation systems that promote collaboration and that are co-administered by the district and teacher unions can and do in fact exist. Some school districts have adopted evaluation systems that minimize the high-stakes role of standardized tests and evaluate education professionals by supporting struggling teachers and recognizing those who pursue robust professional development. Increasing communication between parents and schools can be achieved through targeted action steps and collaboration between teachers and administrators. All teachers, especially new teachers, should practice effective communication strategies, so they can have confidence when sharing with parents. Just as teachers focus on improving instructional practices and skills, they should also focus on strengthening their communication skills. Member mobilization is essential in electing union-endorsed candidates in school board elections. Beyond canvassing and phone banking, social media is a great way for members to share information about candidates and highlight where they stand on education issues, and ultimately build support for them. School social workers’ roles and responsibilities should shift from solely counseling specific students to servicing all students despite their academic classification. And all schools should implement a social and emotional learning program. Elementary schools should commit to ensuring that students engage in recess at least once a day for a minimum of 20 minutes; twice a day would be better to give students downtime during the instructional day. In addition, teachers should eliminate the loss of recess as a punishment for classroom misbehavior and allow all children to participate in recess unless misbehavior occurs during recess itself. To address the high rates of teacher attrition, site-based leadership teams, professional networks, and school districts need to address the real reasons teachers leave the profession: lack of relevant, useful professional development; inattention to mitigating disruptive student behavior; inadequate school leadership; and unacceptable teaching and learning conditions.